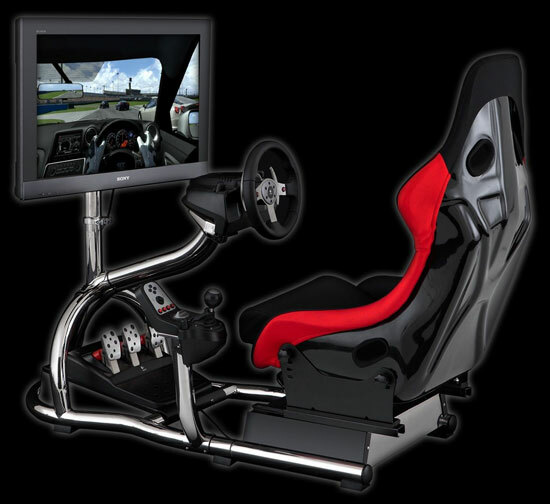 We provide Race Simulators for hire for events in the Midlands, central UK, and further afield upon request. Choose your race sim from smart race seat frames with force feedback wheels or even an inflatable F1 car. 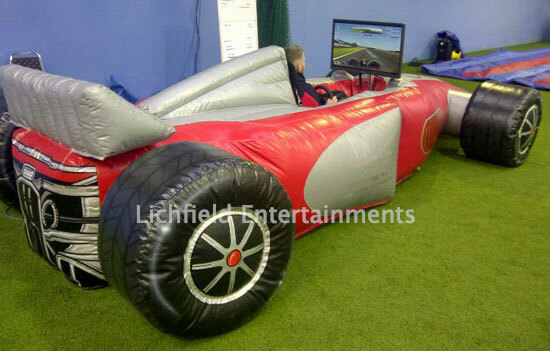 Below is our fantastic inflatable race car simulator complete with genuine race seat, force feedback steering, and the option of auto or manual shift gears. Because it's only inflated once in situ venues with restricted access such as single doors are no problem. 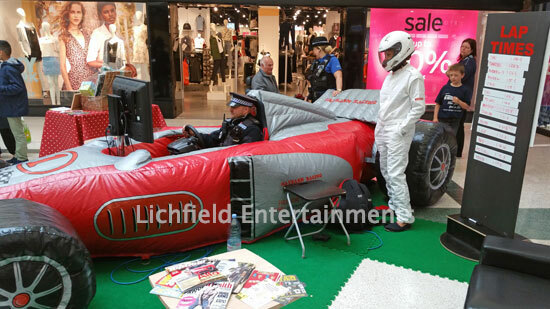 The simulator is supplied complete with a custom made Top gear style magnetic leader board to keep track of laps times and normally comes with a member of staff to run it on your behalf. This simulator measures 18ft in length and 8ft 6in wide. If you have any queries, questions or would like to hire one of our Race Simulators for your event, please click to enquire and we will do all we can to help. Alcester, Birmingham, Bridgnorth, Bromsgrove, Burton upon Trent, Cambridge, Castle Donington, Cheltenham, Cheshire, Chesterfield, Cirencester, Coventry, Crewe, Derby, Derbyshire, East Midlands, East Midlands Conference Centre, Evesham, Gloucester, Gloucestershire, Grantham, Greater London, Herefordshire, Hinckley, Kegworth, Kenilworth, Kettering, Leamington Spa, Leicester, Leicestershire, Lichfield, Lincolnshire, London, Loughborough, Manchester, Milton Keynes, Newark, Newcastle under lyme, Northampton, Northants, Nottingham, Oxford, Redditch, Rugby, Sheffield, Shropshire, Shrops, Silverstone, Solihull, South Yorkshire, St Georges Park, Stafford, Staffordshire, Staffs, Stoke on Trent, Stratford Upon Avon, Telford, Warwick, Warwickshire, West Midlands, Worcester, Worcestershire.